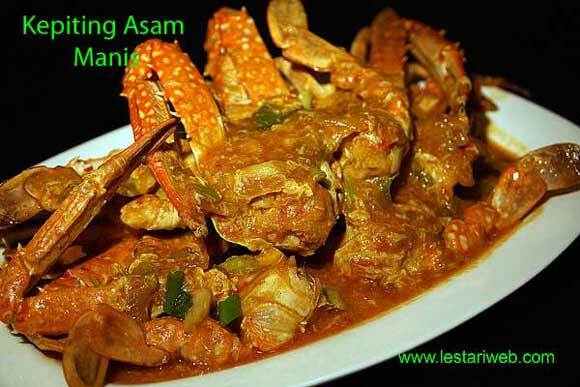 If you use fresh swimming crabs : clean under the running water, cut in half lengthwise. Set aside. If you use the frozen one, they are already cut in pieces. Just clean under running water & set aside. Chop the other half of the onion finely. Put aside. Heat 3 tbsp oil in a Wok or big saucepan. (Don't add oil if already added in a blender). 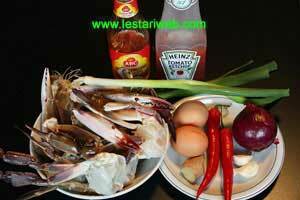 Stir fry the paste & chopped onion. Stirring all the time until well cooked & fragrant. 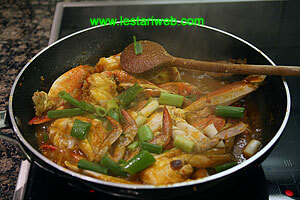 Add the crabs and stir to mix. 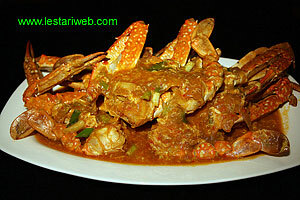 Cook until the crabs turns it's colour. ( It becomes orange or red). 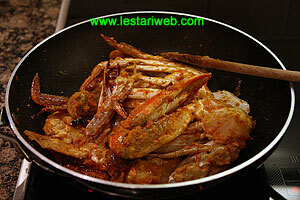 Pour in the hot water, bring to boil over medium heat & cook until the crab's meat is well cooked. Add the tomate sauce, chilli sauce, pepper, chicken broth powder, lime juice, salt & sugar. 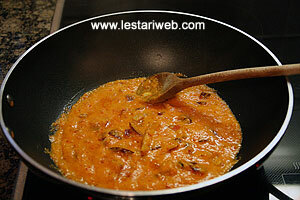 Add the cornstarch mixture, stir quickly until the sauce becomes thicker. 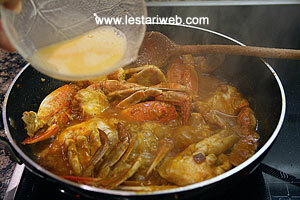 Push the crabs i the edge of the pan, add the beaten egg direct into the liquid, stir to mix quickly. Adjust the seasoning, add salt or sugar if necessary. Add the spring onions, cook for short only. Put on the serving plate and serve while hot.